Its Daddy's birthday in a few days time, I have actually suggest that we have a buffet dinner at Carousel in Royal Plaza on Scotts. Wanted to go there with him since last year but never have the time n chance. However Daddy says he prefer to spend it at home, cook a few dish for dinner, a quiet time with us. We planned the menu on Friday and went out to get the ingredients yesterday. He says he will prepare dinner (thought it is suppose to be his birthday dinner and I should be the one cooking), I only give a little bit of advice on the pumpkin soup. 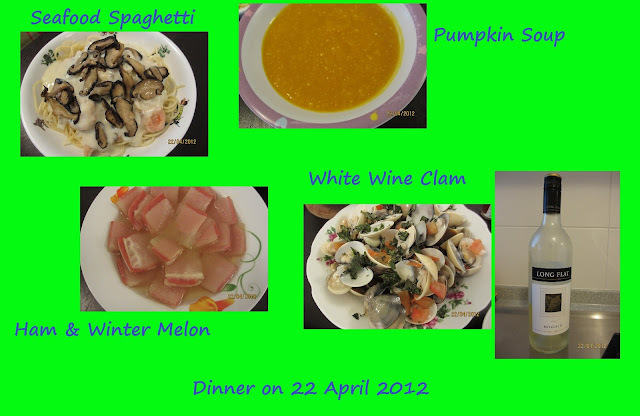 Simple Westen dinner (except for the Ham & Winter Melon in Chinese style), but we enjoyed it alot. Daddy post in his fb "Should make dinner cooking an every sunday event!" hehehe~ Well, it sure will be a weekly event.